Tag Line : Once a Biker always a BIKER…. Rider Manias attended : 2006 – Chennai, 2007 – Nagpur, 2008 – Hyderabad, 2009 – Ooty, 2010 – Vikramgad, 2011 – Kolkatta , 2012 – Gurgaon , 2013 – Shillong (attending) and will be continued ………. 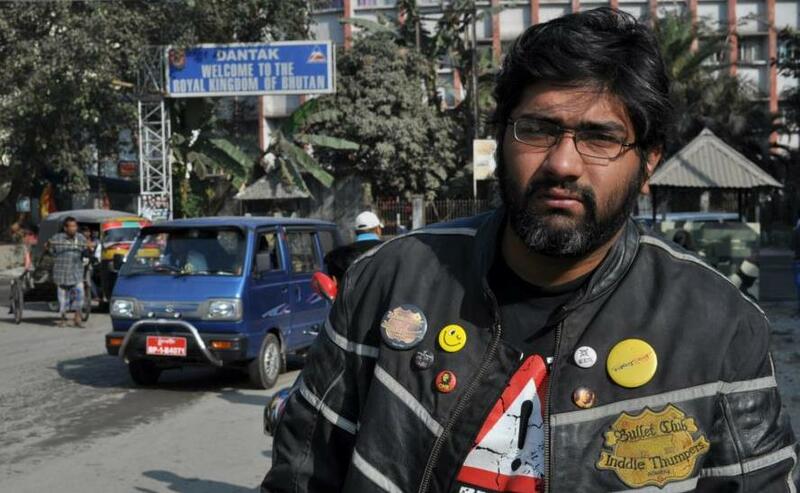 I am Apurva Samant, known as “Appu” in the biking community. Pucca Mumbaikar with an eclectic mix of experiences across the country. A Typical Marathi mulga by heart and all time Black Sabbath and OZZY fan. Pure adventure guy! Started with cycling at a very young age, did adventures trips during school days. Desperately wanted to have a bike once I entered college. As soon as I was 18, I started demanding for a bike. After waiting for several months, I had to plead, revolt, resort to hunger strike, so that my parents would buy me a bike… which finally happened in the year 2000 – a plastic one though. Rode the plastic like a lunatic all across the streets of Mumbai. Then the first big accident took place in 2002, I broke my right hand and right leg, the doctors had to put implants in my right elbow as it was a major dislocation. Was at home for about 3 months. My parents sold my plastic when I was in hospital! Thanks to my accident – Bikes were a taboo for me. Moved to Pune in 2004, took my Bullet “Red Cherry”. Did many solo rides in and around Pune. Then came a time in life when I got bored of riding solo and wanted some friends with whom I could ride. So joined the Pune Bullet club “Roadshakers” in 2004. And also felt that I required a good faster machine. So had to let my “Red Cherry” go ? I then bought a second hand Royal Enfield Lighting 535 CC “Paranoid”. This machine changed my life. “Paranoid” had immense power under the petrol tank and it was one of the best bikes to explore new places in Maharashtra (ghats) solo and also with the “Roadshakers”. Riding with the Pune club, was always fun. “Roadshakers” taught me what riding is, what is group riding, how to ride on ghats, how to maneuver the bike etc… I had some crazy riding time with Roadshakers from 2004 to 2006. In 2005, I bought a second hand Electra “Hellraiser” which I am using currently. In 2006, I was transferred back to Mumbai and then I joined the Inddiethumpers family. Had the good rides in 2006 but then I was again moved out of Mumbai to the next destination Hyderabad. Now was the time to explore Andhra Pradesh. At this moment had 02 machines “Hellraiser” and “Paranoid” to shift. Gave my “Paranoid” to movers and packers along with other stuff to ship to Hyderabad and I thought of riding solo to Hyderabad. My first ever one day long solo ride “Mumbai – Hyderabad” which I enjoyed thoroughly. In a span of 3 years – I did this route solo 6-7 times. 2006 – Explored many untouched places in and around Hyderabad. In 2007, met and started riding with Hyderabad Sunday Riders (now known as Highway Nawabs) and this time it was the whole of Andhra Pradesh, the untouched beaches of the eastern coastline. Also helped the Highway Nawabs to grow up to their royal name and fame and introduced them to Rider Mania in 2008. 2008 Post Rider Mania in Hyderabad moved to Bangalore. Had the opportunity to ride with riders from Bangalore, explored Karnataka. In the same year also stayed for few months in Chennai and Delhi. Met some very good riders and did some pretty good rides. 2009 had to sell my “Paranoid” . Again moved to Hyderabad from Bangalore. Did Bhutan with our family members (Tappet, Deepak, Datta) and Wanderers. 2010 continued exploring of Andhra Pradesh. Then in 2011 moved back to Mumbai with the family members. Had a tragic accident, for some balancing act to my body. But back on road and kicking some a*** again. Many more rides to go to explore some new places. They say once a thumper always a thumper! These are not just words for me but a way of life! Life is like a road, good patches and rough patches galore. And riders know that this is their terrain – some good, some bad but we keep riding!! !